In the immediate aftermath of World Cup 8, The Eighth Man staff sat down together to discuss what happened across two crazy days in Rock Hill. From slow ball to Swiss style, our staffers break it all down. Ethan Sturm: It’s hard to believe we’re here again. Another post-World Cup Monday with University of Texas at Austin celebrating a World Cup title, a three-cup run that easily trumps anything Middlebury College ever did and that will likely long stand proud in our sport’s history. Favorites in none of the last three World Cups, maybe only the best team in one, they just seem to have another gear on World Cup Sundays. 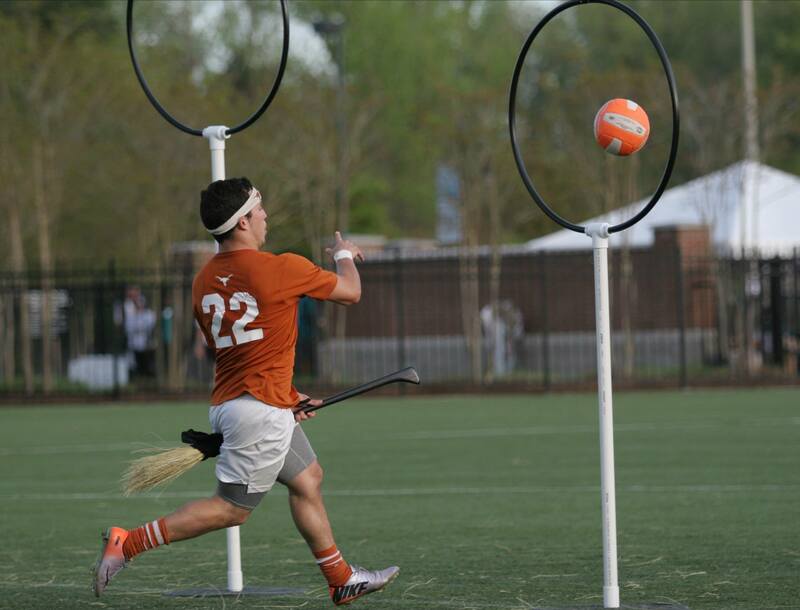 With a new format that pushed everyone to the brink, on a weekend that Lone Star Quidditch Club lost twice and Baylor University lost thrice, Texas went undefeated again. How does this team keep doing it? Michael E. Mason: My two cents only worth one: teamwork. Yes, there are amazing individual players, but watching them this weekend was like watching a well-oiled machine. They worked together on every play and never seemed to get flustered or upset. They communicated without getting into that yelling at each other mode. They played together instead of individually. Alex Wilson: Talking to Texas players after playing them at their regional showed me their resolve. Obviously disappointed in their play that weekend, I knew they would realign their focus leading up to World Cup. They kept giving uniform answers about their belief in their “system” and when they recruit they make it clear they are recruiting World Cup champions and get the whole program sold on it. For most teams, if you come in with only being number one as your focus, and you put your whole year worth of effort in and come up short, it puts a bad taste in your mouth, and so few teams are willing to buy in enough to be competitors with Texas. Eric Wasser: I think Texas tends to do what we at Michigan Quidditch do, in that they don’t worry about winning until it matters. They just do it much better. Like Dan Hanson said, “Forget the fall, we’ll just be great in the spring.” They win when it counts because winning every game before the championship isn’t prioritized over developing the program. Tad Walters: Also, I think it’s so important to note how Texas is almost inarguably always the team that undergoes the most changes from the Southwest Regional to World Cup. I don’t know what they do in that short span of time, but it works. That all being said, Texas completely dominated the snitch game. Michael Duquette and Freddy Salinas maintained control during the seeker floor, but they weren’t too effective in running 1.5 against Lone Star’s beaters. However, the snitch game was a different story. Texas’ beaters absolutely dominated Lone Star’s beaters, making catch after catch and beat after beat. In the end, that was what mattered. I will say, year after year, Texas’ seekers are always underestimated. Evan Carr might have caught the snitch, but the fact that their starting seeker is a freshman bodes well for the future success of this program. Ricky Nelson: Honestly, I’m surprised how little I care about the Texas side of the storyline. Having been demolished by Lone Star, I’m confident in saying they were equal to if not better than Texas. That being said, it’s the equivalent of playing three Texas teams. These are people who left their teams for what I can only imagine was the promise of a title. They missed it a second year in a row. I’m curious how the team holds up against the weight of missed expectations. Daniel Daugherty: It is an incredible storyline, and I agree with Ricky. Somehow, someway Texas continues to be a dominant program, and I think it is because what they have become is greater than what Lone Star or anyone else can throw together. Texas has been breeding and developing excellence for years now and they just continue to reload with people who only know how to play with each other in one system. And they somehow haven’t become like the Yankees where people love to hate them. They continue to be a fan favorite because of what Lone Star has done the past two years with putting their team together. Sturm: I really think when it comes to accepting this defeat, Lone Star has two well-defined factions. Their ex-Longhorns have achieved everything, from World Cup to regionals to Global Games, and it shows in the attitudes that Kody Marshall and Stephen Bell bring to the pitch, day in and day out. But for those Texas A&M University players, it has to be wearing on them. For those that were still Aggies last season, they’ve now entered every World Cup since World Cup V as either the objectively most talented team or the favorites, and every year they’ve met with disappointment. Whether it will just continue to drive them, or finally start to get inside of their heads, remains to be seen. Nelson: So the two best teams were in the finals, we can agree on that. But does anyone think it was the best 24 in brackets? Yes, this is bringing up Swiss, but it needs to be discussed. There are so many 3-2 teams that, through no fault of their own, had weak strength of schedules. That is what happens with random assignments. Wasser: I think in a lot of those cases, 3-2 with weak strength of schedule, meant they couldn’t get a quality win when it mattered. I think at worst two of the bracket play teams were questionable. Swiss was as effective as the randomly drawn, seeded pools, where a team like the NYDC Capitalists is eliminated before bracket play, but Grand Valley State University isn’t. Daugherty: As the head captain of the 25th-seeded team, I will make this comment as unbiased as possible: I don’t think you can continue to put so much emphasis on strength of schedule when half the teams know going into day two that they are not making bracket play. Who is to say the team you played is the team that decides to not care and get completely drunk on Saturday night? Who is to say which team would actually win if teams had something to play for? I just think at the end of flight play, there isn’t a great reason to judge who makes it to bracket play off of other teams’ mindsets. (To be clear, I have absolutely no thought or reason to believe that any of the teams I played had a poor mindset throughout the day). Sturm: I don’t think the 24 teams in bracket play were the best 24 teams, and I don’t think it matters. In the old format, the 48-team bracket had to be looked at as a standalone entity, because every team with half a pulse—sorry NYDC—made bracket play. In the new format, the bracket is a fluid part of what is happening. Bowling Green State University and the LA Gambits are the two examples many people are holding up as the biggest faults of the Swiss system, but in my mind they are the perfect examples of why it worked. In the past, you got one shot in this gigantic bracket to prove yourself against another good team. Lose it, and you’re done, rinse and repeat. That wasn’t the case this year. Bowling Green got a shot at two different regional champions. They lost both games. At that point, the format was confident saying they didn’t deserve to be champions. They probably didn’t deserve to be 25th-ranked either, but it’s not the job of the World Cup format to rank 2-80, it only has to get No. 1 right. When you look at the Gambits, it’s a similar situation. They went through a hellish run of games that included three Final Four teams and Baylor. They lost to all three Final Four teams, but it’s also important to note that they got three opportunities to beat one. If they succeeded on any of those opportunities, their whole tournament is different. But they failed all three times, so the format considered them unworthy of being champions. They probably deserved more than a Sweet 16 finish, but again, the format’s job isn’t to distinguish between being a top eight team and a top 16 team, only getting the two best teams played in the finals and ultimately the best team overall. Daugherty: I think the format only trying to find out who is the rightful champion is a great explanation, but I don’t think it is fair to the teams deserving to be in the top 24 to only have a system where they don’t care who gets 2-80. Especially since a team can make a run in bracket play by making necessary adjustments. That all being said, an interesting way to look at it is what if Bowling Green and Ohio State University were in instead of The Warriors and University of Missouri? Both had the exact same SOS, with the former having better point differential just in the wrong flight. Does the 12 best from each flight really ensure best teams and the best looking bracket? Especially since I heard a lot over the weekend from people that The Warriors didn’t look good all weekend and they still upset QC Boston: The Massacre. Nelson: The point about adjustments is very legitimate. The perfect example is the Texas State University stall ball “win” over Lone Star in flight play. They played again in brackets, and Lone Star adjusted and won. Sturm: I just don’t think it’s fair to ask much more from a system that needs to accurately crown a champion from amongst 80 teams in two days in a full-contact sport than to accurately crown a champion. And when it came down to the end of Sunday, it had done just that. This is the first year with all four Final Four teams coming from our Top 10 since we started rankings. The clear best two teams were in the finals. To me, the system worked. On top of its accuracy, and I know this point is way less important from a player’s standpoint, the format made Saturday awesome. I had the privilege of being involved with the refereeing of two different games on day one—Texas State vs. Lost Boys Quidditch Club and Lost Boys vs. Gambits—that had finals type atmospheres. Cross-region matchups we’d been waiting on for years shaped up. The quidditch was exciting and compelling from brooms up Saturday morning until the final whistles Sunday night, and that’s tough to argue with. Daugherty: Ethan, I am not a proponent of doing away with Swiss; I’m merely looking at possible adjustments that would have made it a little better. I hate to use my own team as an example, but it has to be done in this situation. If you take out The Warriors and Missouri and put in Bowling Green and Ohio State in their place, then Bowling Green would have played Massacre, University of North Carolina and University of Maryland to try and get to the Final Four. With adjustments from Saturday, that could fathomably have been accomplished. Sturm: So since we’re talking about teams that might have been unlucky to miss bracket play, let’s talk biggest World Cup disappointments. For me, it’s got to be Ohio State. Devin and Luke were both all over that in their opinions piece, but the Buckeyes really didn’t show up. They were out of snitch range once all tournament, and they went 3-2 with a third game against Sam Houston State University in which they needed two snitch pulls to win in overtime. The third-place team in the Northwest kept them in range in a must-win 2-2 matchup. Where were they this weekend? Daugherty: It’s hard not to agree with Ohio State; they just did not practice enough. I’m extremely surprised they were the 14th seed in the flight based on their narrow victories over teams they should have been crushing. It is definitely a bummer. 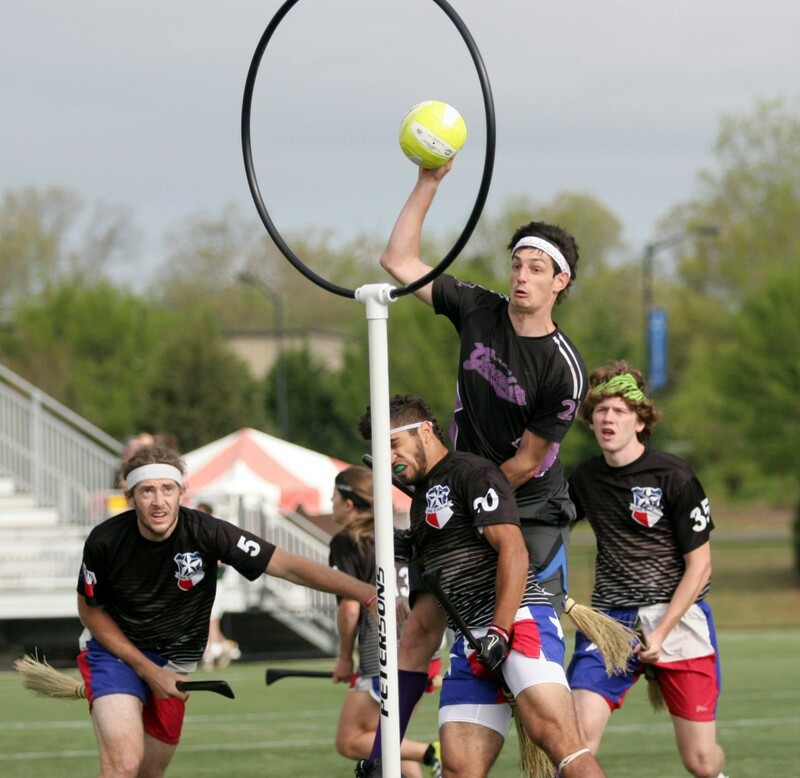 I think somehow we missed out on four of the Midwest’s top six teams in bracket play: Bowling Green, Ohio State, Ball State University and Kansas Quidditch. Wasser: Having talked to two of Ohio State’s three captains, they just lacked the necessary commitment since their regional to maintain their level of success. They played no official games, and apparently their practices usually had dismal attendance. Basically, they went from being a top squad to an average team because that’s the dedication they got from the team. Kyle Jeon: We should also mention the weather and practice opportunity disparity between the warm and cold regions. It was pretty obvious to me that Northeast and Midwest teams were very rusty and that the Southwest and West teams came out looking sharper. The cold-region players also had some trouble adjusting to playing in the heat—I know I did. Nelson: I was about to say, the weather in the north demands a much higher level of commitment just to show up during half the season let alone go hard at practice for hours. Sturm: I guess the other easy target for disappointment is Baylor, but I think that explanation is far easier. With beater Timothy Brestowski still far from 100 percent, Brittany Ripperger still sidelined, and then Ripperger’s backup Hannah Johns being knocked out of the tournament in the third game, they just didn’t have the bludger game left to play at the level their defensive system requires. But even with that, I think a lot of teams attacked the zone very smartly to allow themselves to stay in games with the Bears. But, injuries or not, it’s hard to imagine a Southwest big four team losing three games in a tournament, especially with none coming to another Southwest squad. Daugherty: The first sight at the gap between the Southwest and the rest narrowing? Wasser: Absolutely. Sure, the top three teams are a step above, but really Baylor, Texas A&M and other second- or third-tier Southwest teams were clearly beatable. It’s only a matter of time before Lone Star and Texas start losing first to teams like the Gambits and Lost Boys, while everyone else catches up. Nelson: That implies that you think community all-star teams are the only way to match them, and I disagree. I think that it will be college teams to bridge the gap. Half the Final Four were community and half were college, but it was a college team that took the crown. There is just too much restriction on practice time for community teams. 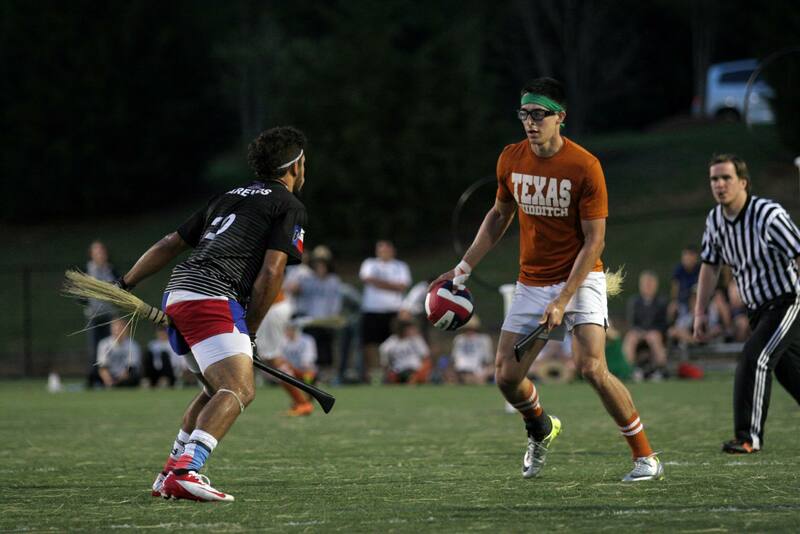 WBQ: I think the more important story is Texas only playing community teams during bracket play: Gambits, Blue Mountain Quidditch Club, Lost Boys, Lone Star. Nelson: And beating all of them. Sturm: Things have definitely narrowed. The result that shows perhaps more than any is the result that never actually happened: Gambits blowing their lead against Lone Star. Losing a game up 70-0 with snitch on pitch is basically unheard of, and it’s incredible how differently we’d be looking at this tournament if the Gambits had completed that victory. Nelson: It’s true. I would be curious to see where Lone Star had fallen in the bracket if they took that loss. Sturm: So biggest surprises. For me, as much I believed in them, it was incredible to see how quickly University of Rochester came together, especially with losing Devin Sandon in the first game of the tournament. Shane Hurlbert really put the team on his back, but outscoring Maryland in the quaffle game and beating Baylor speaks to a lot more than one player, and, from what I’ve heard, especially speaks to the beater play. With that team basically largely transitioning into a new Rochester community team in the fall, along with the graduation boosts The Warriors and Massacre are bound to receive, I wouldn’t be surprised if the Northeast is as community team dominated as the West by next fall. Wasser: I’m still too salty to comment on our North Carolina game, but they were a great team nonetheless. 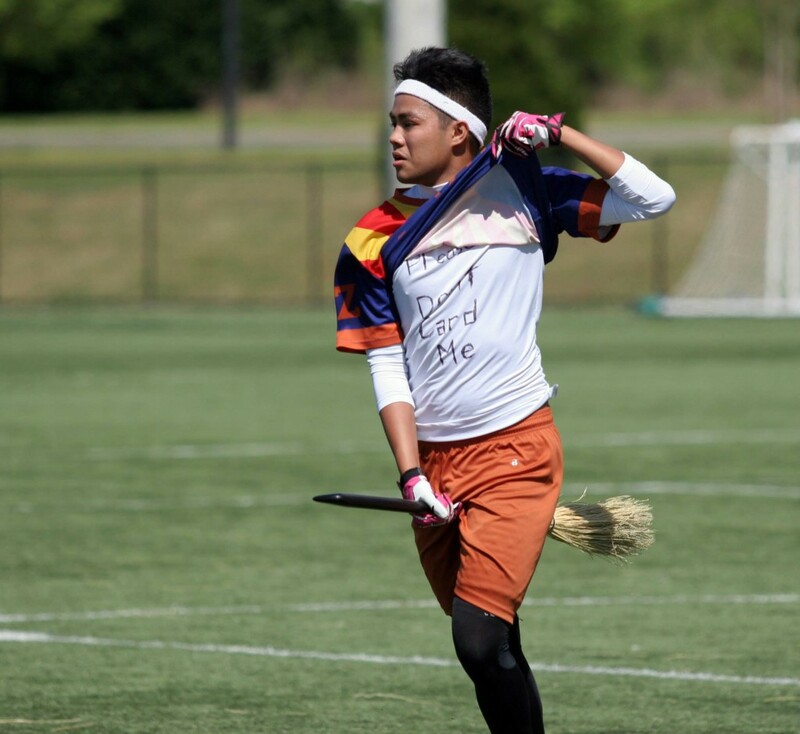 Arizona Quidditch Club definitely benefited from an easier schedule, but that shouldn’t take anything away from what they accomplished with such a short roster. Jeon: No offense to any West people, but AZQC is dirty as hell. They benefitted a lot from poor officiating. Wilson: I mean, I think nine of their 12 players pulled a card during the tourney as well as they had one carded out in our game and several others on the line. Sturm: For what it’s worth, I refereed their quarterfinal game against Lost Boys and ended up giving out 10 yellow cards to the team, including three double-yellow-to-reds. Wilson: What do we think about the weak performances of the tier-two Southwest teams? Sturm: Don’t you mean the thing that happens every year and then we all suddenly forget about it a few weeks before the next World Cup? Wilson: I was particularly surprised about University of Texas at San Antonio and Oklahoma State University, though. They seemed like teams that could have broken through. ­­Sturm: Texas State scored one of the wins of the day on Saturday with a victory over Lone Star in which they killed the pace, passed it around their own zone, and basically limited the first 15 minutes to about five possessions each. The Gambits implemented many of the same tactics while going up 70-0 on Lone Star the following morning. Are we okay with this kind of strategic stalling in the sport? Do we need a rules change? Wasser: I’m fundamentally against it, because it’s a concession, that given the constraints of the game, you are unable to win unless you prevent the better team from having a chance to play. Is it a legitimate strategy? Yes. Do I respect the decision that winning by abusing the rules is more important than having pride in your play? No. Noah Schwartz: Slowing the ball down to a snail’s pace and waiting for the highest percentage chance possible happens in any sport. The “Princeton” offense in basketball is celebrated to this day. Quidditch is a different sport than basketball because of the bludgers. A backcourt rule would give defenses an ungodly advantage. Not being able to move the ball back would leave the sport with so many horrible possessions of randomly throwing the ball behind the hoops and hoping something happens. Sure the game was slow, but every time Texas State attacked there were great opportunities. Secondly, it’s not ruining the sport. On day two, Lone Star handled it beautifully. It’s a different style, but that doesn’t mean it has to be “fixed.” It’s not a problem. Sturm: The Princeton offense is celebrated, but rules were also made so that it could never happen again. But I think you’re right Noah, in three of the four highest profile cases of it being used—by Kansas last year, by Gambits and Texas State twice this year—the better team still won. You can combat it. Daugherty: The first time Texas State did it against Lone Star was the most boring game of quidditch I have ever seen and it was the most watched game of that time slot. Had those two teams played in the championship game and that is how the game was played it would have been a detriment to the sport. From what I heard, Gambits took advantage of every possible scoring chance but Texas State didn’t. They ignored opportunities and kept waiting for new ones to come. Schwartz: I didn’t think it was boring at all. Just to keep the ball, Texas State had to complete pretty much 100 percent of their passes. Watching Lone Star toe the line between pressing and staying fundamentally sound on defense was so much fun for me. I thought it was pretty great. Jeon: The growth of a sport in its infancy is mass appeal, and, no offense Noah, but you’re really into sports and can appreciate subtleties like that, but to 99 percent of the audience, that Texas State vs. Lone Star game was really, really boring. I agree with Dan 100 percent on his assessment of that game. Devin Sandon: I think that the strategy was incredibly intelligent, and yes it’s an assailable strategy, as Lone Star proved the second time. To me, the question is more one of what level of opportunity should a team which knows it can’t compete get to win against a team which both sides knows is superior? I don’t like the fact that Lone Star had to toe the line of deciding whether to play sound defense and have the game come down to a snitch grab, or attempt to make Texas State actually play and give them a much better chance of converting their possessions in doing so. Sturm: Alright let’s hear some of people’s favorite games from the tournament. Schwartz: Lone Star vs. Texas State on day one. Reasons stated above. Lone Star had to walk a very fine tactical line while still being able to force Texas State to complete every pass perfectly in order to maintain their hold on the game. It really felt like Texas State was on the edge of a cliff the whole time and you’re just waiting for their grip to give out and it never did. I mean it when I say it, it was one of my favorite games of the tournament because Texas State had to be perfect and Lone Star for the first time I had seen had a ton of pressure put on it systematically. Dan Hanson: Favorite game was without a doubt the finals. The two best teams in the sport in the highest stakes game, playing at their top levels. The World Cup VI final wasn’t as good as that game could’ve been, the World Cup VII final was a strange matchup and game, but the World Cup 8 final was perfect. Gambits vs. Lone Star was an easy number two. I didn’t get there until it was 50-0, but the Gambits played great, every drive was smart with an extremely skilled finish. Ren Bettendorf’s goals were awesome. 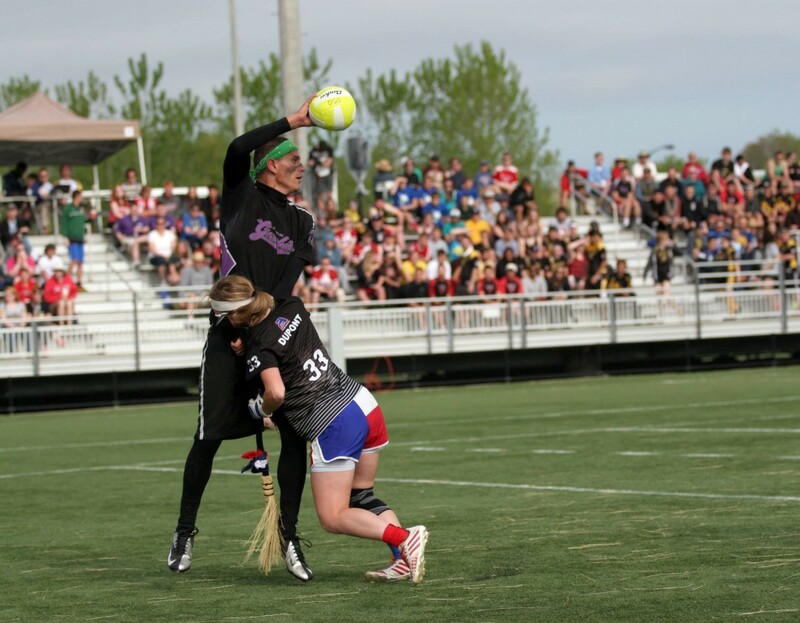 The comeback was unprecedented, and showed why you can’t rule much out in quidditch, which is what makes this sport so great. Lone Star vs. Texas State on Saturday was my third favorite. I loved the strategy, and when they executed, it was so epic. People kept on doubting Texas State against Lone Star, but they shut up the haters, just like they’ve been doing since the Sunday of World Cup VII. Wasser: Michigan State University vs. Emerson College. Michigan State was the clear underdog after a cakewalk in flight. They made the catch to take it into overtime, then took control of the match. They took it out of range and continued to dominate until the five minutes were up. It was great to see such an emotional turnaround and have the Spartans disprove those who said they could only win easy games. Hanson: The regional perceptions went nuts this weekend. The Mid-Atlantic picked up some huge wins, and North Carolina proved that they are legit. They are total winners. University of Virginia came out of nowhere to play really excellently, winning big games and holding the Lost Boys close when they were eliminated. The Northwest couldn’t have had much of a better finish after a mess of an inaugural season, with University of British Columbia playing inexplicably well against three previously-ranked teams that everyone expected would crush them. Sturm: Is the West back? The Gambits and Lost Boys are who we thought they were, but what else did we really get? AZQC rode matchups and referees that wouldn’t call them on their illegality until they ran into a yellow card shaped wall. Crimson Elite got fat on overrated tier two Southwest teams. Silicon Valley Skrewts turned 2-0 and up 40 on Tufts into a 2-3 tournament. The Santa Barbara Blacktips did earn a great win over New York University, but are we really giving the region “West is back!” credit off of that one win? 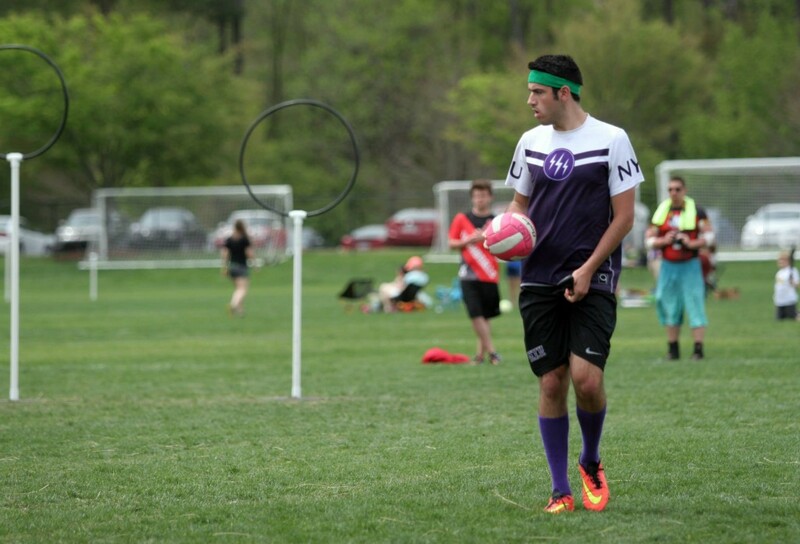 Sandon: I have to say, NYU seemed like one of the most inconsistent teams this weekend. I was really surprised at the differences between their level of play in the Blacktips game, versus the University of Arkansas game, and I really wish I had been able to see the AZQC game. Kevin Oelze: I feel like the West makes a very strong case this year for second best region, which shocks me because of how unimpressive I thought it had looked all year. I think you’re thinking of it the wrong way. This tournament had so much alternate history, and it’s important to look at how close teams were as well. The Skrewts had one of the most impressive starts to the tournament and then fell flat… but did they really? Tweak really tiny things and all of sudden they’re 3-0 and probably have a winnable game at 3-1. Alternately, they were up on quaffle points on Rochester, but lost to a great seeker and a snitch that lasted ten seconds. Then they get a really tough 2-2 draw and lose to a stylistically challenging Minnesota team for the way the Skrewts play, again on a snitch who lasts eight seconds. For a team that’s generally really good with the snitch on pitch, snitches getting caught egregiously early is a pretty rough blow. If you don’t get blinded by expectations going into the cup, I think you could realistically make the case that the Skrewts, even at 2-3, were the best team to not make the bracket. Now, AZQC. Sure they had an incredibly easy 3-0 matchup, but other than that their schedule wasn’t particularly easy. Texas A&M was a pretty rough matchup in the first round, and then they had Emerson and Arkansas, who while not great, were still strong teams. Arizona State University had Blue Mountain in overtime. UCLA had Blue Mountain down 20 points at the snitch pull. Blacktips went 4-1. Crimson Elite was just good. Northern Arizona University was a reasonable 3-2 and played a good QC Boston team almost within snitch range. Sturm: That’s the hard part about this cup. There’s a million what-ifs. Which, to me, just means parity—outside the South—is better than ever before. Sandon: I think there was just a ton of parity in general, but Swiss made for much, much better matchups and generally higher quality games. Sturm: So let’s close it up with the always controversial question: Texas won World Cup, but were they the No. 1 team? Sandon: I thought that Lone Star’s quaffle players were, in general, stronger individual players. I thought that Texas used its offensive possessions more intelligently though, and had their beaters and chasers much more in sync with each other. On top of that, particularly for when snitch was on pitch, I thought Texas’ beaters had a definite edge over Lone Star’s. Given the way the two teams were playing, I think the game would probably usually end on a snitch pull, and I think Texas looked likely to pull more often than not. Beyond that, Texas was far more dominant against other opponents. Lone Star seemed more vulnerable, particularly against the Gambits. To my mind, Texas won the tournament and was the No. 1 team.